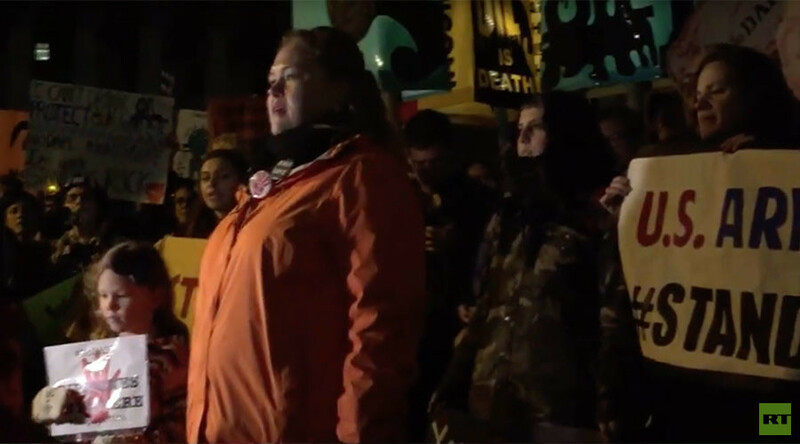 Members of the Resist Spectra movement have been sentenced to fines and community service for protesting a pipeline extension being built in upstate New York. RT America’s Alexey Yaroshevsky spoke with Courtney Williams, a member of Resist Spectra movement, about the Algonquin gas pipeline extension that passes through her neighborhood. More than 250 activists have been arrested over the past two years for protesting the AIM pipeline. They have staged a 60-day protest outside the Manhattan office of Senator Charles Schumer (D-New York), handcuffed themselves to pipelines, and climbed into pipes to block further construction. The proposed AIM pipeline route will run from Lambertville, New Jersey to Boston, Massachusetts. Not only will it run under the Hudson River, it will also run within 100 feet (30 meters) from the Indian Point nuclear power plant, the movement claims. The Indian Point facilities have been plagued with numerous safety violations over the last 18 months, and Williams worries that a pipeline being placed so close to the nuclear plant could cause problems. “If something were to go wrong at Indian Point, and both the primary and secondary power supplies were taken out with a rupture, we’re looking at the plant being unable to safely shut down,” meaning the pipeline could not function properly, and so gas would also be a problem, Williams said. In his article, he shows how the husband of FERC’s environmental project manager, Maggie Suter, was consulting for Spectra. “There is a real potential that the review conducted by the firm and the FERC officials, they were tainted,” Vardi told RT. New York Governor Andrew Cuomo (D) has since reached a compromise with Entergy, the company that owns the Indian Point power plant, to shut down it down in the next four years. However, part of the pipeline has already started transporting gas. “They’re passing within 400 feet of an elementary school, they’re passing within 50 feet of homes,” Williams told RT. “The regulatory agencies have failed us, our elected officials have failed us,” she said.